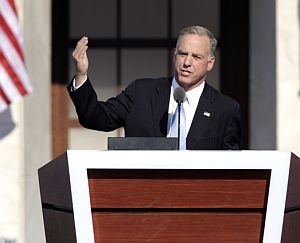 (Host) Former Vermont Governor Howard Dean is getting a lot of attention at this week’s Democratic National Convention. But not all of the delegates agree with the way he’s handled the party as its chairman. Todd Zwillich caught up with some of those delegates, and with Dean, at the convention. (Zwillich) As chairman of the Democratic National Committee, former Vermont Governor Howard Dean makes a lot of speeches here. Usually it’s the traditional mixture. (Zwillich) It also means a dose of the mundane. (Zwillich) But Dean’s role in Denver goes far beyond standing behind the podium. He took over the party in 2005 and presided over big Democratic gains in Congressional elections the next year. He’s also made some controversial decisions that not all in his party have supported. Dean is the mastermind of the so-called 50-state strategy. Instead of focusing campaign money in states the party thinks it can win, Democrats now try to challenge Republicans, even in GOP strongholds. For example, in the past Democrats spent a lot of cash in so-called battleground states like Ohio with only token efforts in heavily Republican states. Under Dean, that’s no longer the case. (Dean) "I think people misunderstand the 50-state strategy. It doesn’t mean you spend the same amount of money in every state. But it does mean every state has a core competence so that every state has an ability to run a decent operation, whether we’re competitive there or not." (Zwillich) It’s making a big difference in states like Virginia. In the past, Democratic presidential candidates have scarcely tried to compete with Republicans in the traditionally conservative state. But now, Virginia is showing signs of edging closer to the Democratic column. And Dean and his party intend to win it for Barack Obama. Randy Clear is a computer programmer in Norfolk, Virginia, and a convention delegate. He says the strategy is evident when he spends his time trying to round up foot soldiers for Obama. (Clear) "I think that Virginia being competitive in this race is largely due to Dean’s strategy. If we had gone the traditional route, we would have decided that Virginia was still a Republican state, the resources would not have gone in there and wouldn’t be there now." (Zwillich) But if the strategy is popular in new battlegrounds, it’s made delegates from the old battlegrounds uneasy. That’s because they get a smaller share of Democrats’ national war chest. Kevin Malecek is city council president in Willoughby Hills, Ohio. He’s a delegate from a traditional battleground state, who eyed the 50-state strategy with suspicion. (Malecek) "I would say I had some doubts about it when he first started it up. Because it’s very questionable. You’re going to try to spread your resources very thin over a majority of American states and not have a situation where you’re trying to concentrate on areas where you know you’ve done well, where you know you can win, where you know you need those states to win an electoral majority." (Zwillich) Some Latino party members have also criticized Dean for his approach to that key voting bloc. Democratic support among Latinos eroded in recent years. Steven Ybarra is a teacher and a delegate from Sacramento, California. He blames Dean for the slip. (Ybarra) "Howard Dean got up today and said we’re the most underregistered group, the Hispanic caucus, in however long. And if that’s the case it doesn’t speak very intelligently on his behalf as chair of the DNC." (Zwillich) The Obama campaign is putting $20 million toward getting Latinos to the polls this November. Ybarra says Dean had to be dragged along. Dean says the new money for Latino votes was a joint decision between Obama and the party. (Dean) "We’ve spent a lot of time and effort and money working very hard with Latino voters. We have more Latino delegates here than have ever been here before. So I think we’re doing a really good job reaching out and we’re going to do an even better job." (Zwillich) George Bush cut into Democrats’ dominance among Hispanics in 2004. George Bush beat John Kerry in Ohio in 2004. Malecek, the city councilman from Ohio, says he doesn’t want to see his state slip away again because Dean wants to target new battlegrounds. But he admits he likes the fact that Democrats appear poised to make gains in the Western states Dean is targeting. States like New Mexico, Nevada, and of course, Colorado, which, under Dean’s direction, is hosting the convention this week. From Capitol News Connection, I’m Todd Zwillich for VPR News, in Denver.